Billy Bathgate, a Harlem, New York native, quickly earned respect, garnering street credibility along the way, for his fierce lyrical skills, and witty wordplay, in and around his neighborhood; the Manhattanville housing projects. He soon went from battling other aspiring emcees in the park to a much grander scale, when he was invited to freestyle for a number of high profile mix-tape deejays, i.e. Kay Slay, Clue, Whoo Kid, Envy, Enuff, Dirty Harry, Kool Kid and Clinton Sparks. Word spread fast about this super talented newcomer to the game, and before long many major labels were reaching out to offer Bathgate, a moniker he borrowed from the graphic novel & film of the same name that tells the story of a teenage boy who becomes the surrogate son of doomed mobster Dutch Schultz, a recording contract. He weighed out his many options, and with Virgin looking to be the most promising, Bathgate signed on the dotted line. His lead single, 'F! @# That,' or its much cleaner title, 'Bump That,' was a smash underground hit, and had Hip-Hop heads anxiously awaiting his, at that time, forthcoming stellar solo outing, Dear Rich America, My Story To You. MVRemix: You are finally gearing up for oft delayed debut album - What's to be expected from it? Bathgate: I have some dope producers to look out for. My album is bringing worlds together, and creating a new space of music - The sound is new. MVRemix: Is it still being called Dear Rich America, My Story To You? Bathgate: No, it is called Hard Candy now. And, it represents doing what you feel. It's like a drug. It's addictive. It's really like a drug. Music is a drug, and we need a new brand, a new drug. MVRemix: How does this project either differ and/or compare to that of your unreleased first project? Bathgate: My unreleased album was soulful. I mean, I worked with Just Blaze before he did Jay Z's The Dynasty album, and Kanye West before The Blueprint - I was ahead of my time. The music was raw. It's before I really knew how to do this. MVRemix: Why did you opt to stay gone for so long? Bathgate: Sometimes you have to go backwards in order to go forwards. I had to understand who's with me and who's not. Plus, I had to grow into who I really am. MVRemix: Aside from putting together Hard Candy, what all had you been doing during your lengthy hiatus? Bathgate: Working on finding me, and at the same time creating a new me. MVRemix: When did you first become interested in music? Bathgate: I've been in love with Hip-Hop since 'Beat Street' the movie came out in 1984 - Ever since The Fearless Four made 'Problems of the World Today.' When Rakim shot 'I Ain't no Joke,' video in front of Gems on 125th Street, I was there. MVRemix: Who were some of your other biggest musical influences coming up? Bathgate: From Doug E. Fresh, Kool Moe Dee, to Ma$e, Cam'ron, and Nas. 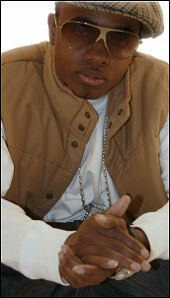 When I was in high school, you couldn't tell me I wasn't Nas. MVRemix: When did you first become serious about pursuing music professionally? Bathgate: When basketball didn't work out . Nah, I just felt like I wanted to get out there - That stage is a rush! MVRemix: What led up to your initial signing with Virgin Records? Bathgate: It was crazy! I finished high school, was in the streets battling, destroying nigg*s, then Gee introduced me to Puff, I wrote for Diddy, the bidding war began, and I was signed with Virgin. MVRemix: You had your single, 'F! @# That,' out, doing well, and the album just about to be released, when suddenly Virgin drops the ball - What actually happened? Bathgate: A lot of things happened. Mariah Carey signed the unprecedented Kevin Garnett deal, and then did a Dave Chappelle bug out thing. Next, Virgin fired 90 people. Aaliyah passed. Kelis left. There was no urban department, and the boat is sinking. Somebody said gotta leave, I left. Wow, that person also said Koch was a graveyard for rappers. I guess I just listened to the wrong advice at the time . But, I'm cool, Ya dig? MVRemix: Are there any future plans to drop some of the tracks from your first project? Bathgate: I might, but like I said, that sound might clash with this sound, and it would be all over the place. MVRemix: How do you describe your sound? "Keep pushing, keep grinding. The biggest failure of man is pride. Just work hard, and bounce back if you fall - This game is crazy!"